Heading into their August 12 “Kids’ Day” game against the New York Giants in Shibe Park, the Phillies were on a roll with four wins in their last five games. In fact, since July 21 the Whiz Kids had won 19 of 26 to extend their lead from a first-place tie to a five-game lead over the second-place Boston Braves. 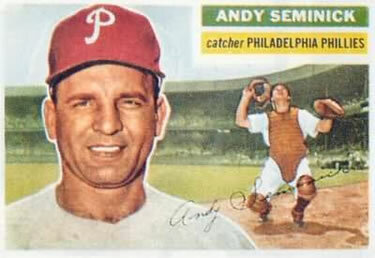 They had split the first two games of the four-game series, but there was added drama heading into game three because of what had transpired the night before, a 3-1 Giants victory over Curt Simmons behind the pitching of Sal Maglie. Seminick was still fuming the next day although Sawyer and Durocher agreed before the game to instruct Stanky to stop his gyrations until they could get a ruling from league President Ford Frick.5 The game featured Phils ace Robin Roberts, seeking his 16th win of the season, against Sheldon Jones, who was 9-12 so far. The Giants quickly loaded the bases in the top of the first with one out, but Roberts struck out Wes Westrum and induced Bobby Thomson to roll into a force out to escape the inning unscathed. Thompson was dazed by the collision9 and while Durocher and the Giants trainer tended to him, the Phillies dugout hollered, “You better call Jersey City.” Thompson was unable to continue and was replaced by Bill Rigney at third. Roberts followed with a single to center to score Goliat, who had moved to second on Seminick’s adventure at third, to make the score 3-1. Once play resumed, the game turned into a thriller. Roberts continued to struggle on the mound and in the top of the sixth with two outs he walked opposing pitcher Kramer, gave up a single to Jack Lohrke (the Giants’ third second baseman of the game), and walked Whitey Lockman to load the bases. Don Mueller lived up to his Mandrake the Magician nickname by singling through the infield to drive in two runs and tie the score, 3-3. Roberts then walked Monte Irvin (the Giants’ third third baseman of the game)16 to reload the bases before retiring Wes Westrum on a fly ball to left to finally escape the inning. In the meantime the Phillies could get nothing going against Kramer. Bobby Thomson then led off the seventh with a home run into the upper left-field stands to put the Giants ahead 4-3. The Phillies, however, came back in their half to scratch out the tying run when Gilbert at first base booted a groundball by Goliat, and Bill Nicholson (pinch-hitting for Roberts), and Eddie Waitkus both singled. Jim Konstanty relieved Roberts and showed his MVP form, scattering two hits over the next four innings as the game remained tied and went into extra innings. In the meantime Dave Koslo, who had relieved Kramer in the seventh, held the Phillies at bay. With one out in the bottom of the 11th, Stan Lopata, who had come in to catch after Seminick’s ejection, tripled to center just out of the reach of Bobby Thomson.17 Koslo intentionally walked Goliat and Bloodworth, batting for Konstanty. Waitkus was next and sailed a flyball to Thomson in center field. It was deep enough to allow Lopata to beat the throw and give the Phillies a 4-3 victory. The run enabled Konstanty to record his 10th win of the season, all in relief, as he extended his scoreless streak to 20⅓ innings. With the victory, the Phillies stretched their lead to five games over the second-place Boston Braves, 6½ games over the Cardinals, and 7½ games over the Dodgers. 1 Stan Baumgartner, “Rigney, Seminick Scrap Spreads Into Battle Royal,” The Sporting News, August, 23, 1950: 6. 2 Stanky had hit on the idea of distracting batters in an August 9 game against the Boston Braves when the Braves’ Bob Elliot asked umpire Al Barlick to move out of his line of vision. Barlick did so but Stanky moved into Barlick’s old spot and succeeded in distracting Elliot, who struck out. Robin Roberts and C. Paul Rogers III, The Whiz Kids and the 1950 Pennant (Philadelphia: Temple University Press, 1996), 248; Baumgartner, The Sporting News, August, 23, 1950: 5. 3 Sawyer called it “unsportsmanlike and purely bush league stuff.” Joseph M. Sheehan, “Phillies Beat Giants in 11th, 5-4, After Players Fight,” New York Times, August 13, 1950: Section 5, 1. 4 Roberts and Rogers, 248-49. 5 Sheehan; Roberts and Rogers, 249. 7 Carson Van Lindt, Fire & Spirit – The Story of the 1950 Phillies (New York: Marabou Publishing, 1998), 123. 8 Roberts and Rogers, 248-50. 9 According to the New York Times, Thompson “went down like he was pole-axed and did not stir for fully five minutes.” Sheehan. 10 Some sources indicate that Durocher directed Stanky to begin waving his arms again after Seminick’s takeout of Hank Thompson. Harry T. Paxton, The Whiz Kids – The Story of the Fightin’ Phillies (Philadelphia: David McKay Co., Inc., 1950), 98. 11 Sheehan. Durocher was incensed that Warneke had not ejected Seminick for throwing his bat. Van Lindt, 123. 12 Roberts and Rogers, 250. 13 The fight was the Phillies’ second major brawl in three weeks. On July 23 in Cincinnati Willie Jones slid hard into Reds second baseman Connie Ryan, spiking him and ripping off his shoe. Ryan responded by taking a swing at Jones and the two wrestled to the ground as both benches emptied. Roberts and Rogers, 235; Baumgartner, The Sporting News, August 23, 1950: 5. 14 Roberts and Rogers, 251; According to The Sporting News, Gilbert was almost hauled to jail for using profanity on the field. “Younger Gilbert, Unlike Dad, Bares Fiery Tongue,” The Sporting News, August 23, 1950: 6. 15 Roberts and Rogers, 251. 16 Irvin replaced Lohrke, who moved to second base when Rigney was ejected. Lohrke had replaced Thompson after Seminick coldcocked Thompson in the second inning. 17 According to the New York Times, Thomson failed to get a good jump on the ball and would have made the catch ninety-nine times out of a hundred. Sheehan. 18 According to The Sporting News, a New York newspaper attempted to reach National League President Ford Frick for a ruling on the legality of Stanky’s antics after he was banished in the August 12 game. A call to Frick’s Bronxville home revealed that he was away for the weekend, staying somewhere on Long Island in a house without a phone. The paper ended its August 13 game story with the message, “Mr. Frick, if you happen to read this, call one of your umpires in Philadelphia. It’s urgent.” “Paper Asks Frick to Call One of Umpires in Philly,” The Sporting News, August 23, 1950: 5. 19 Ken Smith, “Frick Vetoes Wig-Wagging by Infielders,” The Sporting News, August 23, 1950: 5. Leo Durocher was unapologetic afterward, saying that what Stanky had done “was perfectly legal as far as he was concerned” and that “smart ballplayers have been pulling stuff like that for all of the 25 years I’ve been in baseball.” Sheehan. Stanky took the same tack, saying, “If a fielder waved his arms at me, I’d congratulate him after the game for doing anything he could to win.” When informed the Phillies thought he was “bush league,” Stanky retorted, “I don’t care how it looks. All I want to do is win.” Baumgartner: 5, 6. 20 Roberts and Rogers, 255, 267. The Phillies lost, however, 7-4 to Jim Hearn.